The tradition continues! Tony- and Olivier-winning director Trevor Nunn's celebrated new staging of Fiddler on the Roof, currently appearing at the Menier Chocolate Factory, has scheduled a transfer to the West End's newly reconfigured Playhouse Theatre on March 21, opening on March 27. 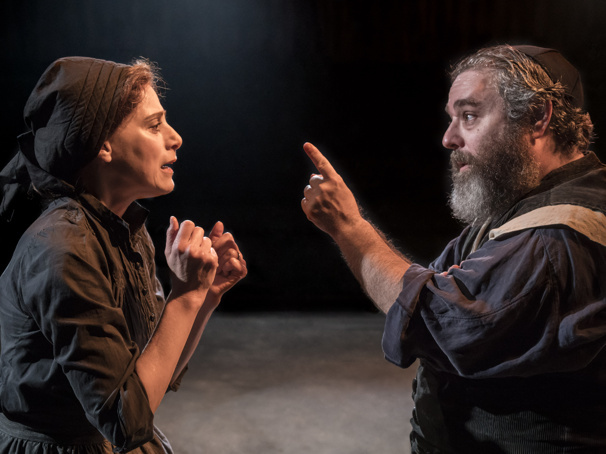 The production's Tevye and Golde, Olivier winner Andy Nyman and Tony nominee Judy Kuhn, will repeat their acclaimed performances for the West End transfer, with additional casting to come. Fiddler on the Roof follows the travails of Tevye (Nyman), his wife (Kuhn) and daughters. The musical features a book by Joseph Stein, music by Jerry Bock and lyrics by Sheldon Harnick. Nunn's Fiddler features the original choreography of Jerome Robbins with additional movement by Matt Cole. The production features music direction by Paul Bogaev and orchestrations Jason Carr, with scenic design by Robert Jones, costume design by Jonathan Lipman, lighting design by Tim Lutkin and sound design by Gregory Clarke. The Menier run will conclude on March 9.